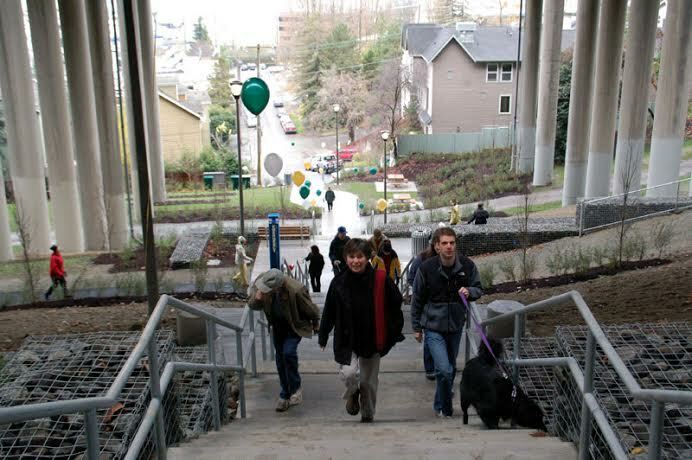 With our third annual Stairway Walks Day just around the corner on February 7th, it’s exciting to talk about projects underway to improve our current pedestrian thoroughfares. A pedestrian route leading from the top of Capitol Hill down to Eastlake Avenue already exists, however the Lake Union Neighborhood Council envisioned a potential major improvement to the area. What if the route were extended to Fairview Avenue, the Lake Union shoreline, and the Cheshiahud Loop, creating a public gathering space that would benefit the community? 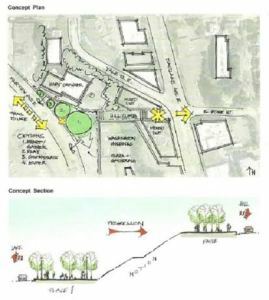 Seattle’s Department of Neighborhoods to create a plaza area and public gathering space along Fairview Ave. E. to be known as the East Howe Steps. Brian Ramey, long time neighborhood resident, has been instrumental to the project. Brian, who founded the Lake Union Neighborhood Council, has lived in the East Lake Union neighborhood for over 30 years. According to Brian, one of the main purposes of the East Howe Steps project is to repair the connection between the top of Capitol Hill and the eastern shores of Lake Union, given I5 cuts these areas off from each other. Brian sees the East Howe Steps project as hugely important to Lake Union’s communities: a current “no-man’s land” can become a vibrant area allowing the community better access to neighborhoods and trails, including the Chesiahud loop trial encircling Lake Union. Brian also feels that physical connections between Lake Union neighborhoods are key to stewardship of the lake and to maintaining its health. Brian’s efforts have ensured that the East Howe Steps project continues to move forward; Brian conducted extensive research into the grant application process as well as engaging community members at every step. Prior to applying for the grant, developers and property owners with property surrounding the East Howe Steps space had begun to approach the city of Seattle seeking permits to develop their land, which did not comply with the neighborhood’s stated goal that the space should eventually become a pedestrian thoroughfare. Brian and other community members lobbied the city to ensure that their plan was recognized, which it eventually was. According to Brian this recognition from the city was a significant milestone. Brian notes that if other Seattle groups are undertaking projects with similar goals, he is happy to help however he can, observing that Seattle’s geography can make linking neighborhoods a challenge. Brian feels that connecting people through public spaces is going to be increasingly important as we try to move away from the use of cars and toward more diverse modes of transportation. If you would like more information on how to get involved or donate to the East Howe Stairs project, you can click here. For more information on how volunteer as a Neighborhood Walking Ambassador for the upcoming Stairway Walks Day, send an email to Jules Feibelmann at: jules@feetfirst.org.